We are often asked if laying a resin bound drive is a DIY job? The short answer is yes but of course, a lot depends on the kit you use and your DIY skills. If you have never laid a concrete path or used a trowel, then laying a drive of any sort is probably going to be a challenge and you would be well advised to get some help from somebody who has some experience. The good news is that often there is no need to hack up your existing drive. If you have sound tarmac or concrete a resin bonded drive can be laid on top with minimal build up in height. With the right planning your existing falls will be sufficient and because you are not laying a new drive you don’t need to comply with the SUDS regulations for surface water drainage and you can save a small fortune. Once you have decided you want a resin drive the next thing is to choose the right kit. There are a number of systems on the market, but it is important to know the difference between resin bound and resin bonded. The bonded kits, most often sold as suitable for DIY, are simply a resin which you trowel on and then throw stones onto. This is effectively pebble-dashing for drives and paths and, like pebble dashing, the danger is that very soon the stones can part company with the resin and you get bald patches. Resin bound mixes the resin into the stones so each one is coated and therefore sticks to its neighbours. Even here you need to select a thickness that is suitable for the location. A path can be laid thinner than a drive and a drive, where cars turn, needs to be thicker than a straight in and out drive. So resin bound is definitely the way to go but the problem for the DIYer is that almost all resin bound systems require a pan mixer. It is impossible to mix resin bound aggregate (stone chippings) in a conventional cement mixer. Many have tried and all have failed because the material turns into balls and sits at the back of the mixer. Fortunately, there is another way, and this is why we like the Vuba DIY kit because the resin is formulated to work with a paddle mixer in an electric drill. But before you grab your cordless drill and start mixing you need to be sure it is powerful enough. Often you will find a main powered drill of more than 550 watts is much better for the job. The good news is that they are cheap to buy, or if you want to go one better choose a dedicated paddle mixer which you can buy or hire. When laying any path or drive the sub-base that you lay onto is the key to success. It is the boring part and you may be tempted to rush this but when you look at all the potholes and cracks in our roads you will appreciate that rushing this part of the job condemns you to years of repairs and the drive will never look as good once you have patched it up. It is also the part where many ‘so-called’ professional jobs fall down. We have all heard stories of people who have had drives laid by cowboy contractors who take no time on preparation. This is one of the main reasons for doing it yourself and why we believe that DIY resin bonded drives can actually turn out better. The fact that you care about the job is a huge advantage over ‘fly by night’ contractors. Once the sub-base is prepared you are ready to mix and lay the resins. You need a dry day for this but if the drive is damp you can blast it off with a large blowlamp (hired) or sometimes a leaf blower will do the trick. Just don’t be tempted to lay the resin on a damp surface, again this is where contractors sometimes take chances because they don’t want to abandon the job and lose a day’s wages. In the Vuba brochure, there is a great deal of practical advice about mixing and laying the materials. If, after studying it closely, you are still not confident the best thing is to try the system out on a small test area of a square metre or so. On a mild day the material is free-flowing and enjoyable to trowel down but if you are concerned about getting it flat then laying some thin strips of wood or metal on either side gives you something to rule across with a straight-edge. If you stick the strips down with some double-sided tape you can lift them up as you go. 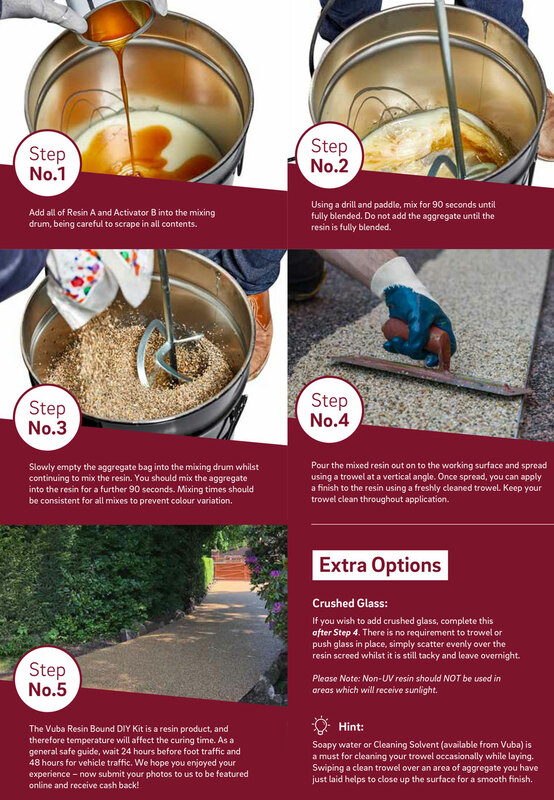 This is a method that is used by professionals when they are looking for perfection when using a resin bound kit. Preparation. If you fail to prepare you prepare to fail. Choose UV resistant resin It costs a little more but doesn’t go yellow. Choose the right aggregate for the desired thickness and consider a blend of stones. Read the Health and Safety notes and buy the right safety kit. Have a plan. Who is mixing? who is laying? and where do you start and finish. Do you need movement joints? This allows you to divide the area up and complete it in sections. Work cleanly and try to avoid walking on the newly laid surface. Check the levels regularly to avoid low spots where water might puddle. The maximum deviation is 2mm. Every surface can benefit from a spruce up every so often and if you’re trying to sell your house, that refurbished drive is a great first impression. Vuba sells coatings for cleaning and re-coating the surface. This gives you a new wear layer and helps prevent moss.